Described as an ‘Innovation Center for Young Minds’ NuVu offers education with a distance and students at this unique learning centre have been in the news thanks to their focus on user-centred design in some of their latest projects. Based in Cambridge Massachusetts the students at NuVu were given a project focusing on the needs of their classmate, wheelchair user Mohammed Sayed. After a crash course in user-centred design and design for all principles the students had one task: hack Mohammed’s wheelchair to make it more user-friendly. Students got to hear what Mohammed wanted from his wheelchair, with over 50 different wish list items considered, and in the end it was just two that were brought forward, conceptualised by his classmates and then prototyped to a condition in which Mohammed could test drive them. One of the ideas which reached the test driving stage was put together by a group who focused on Mohammed’s need for speed. An innovative gear and lever system, which locks onto one of the wheels of the chair (pictured) was the end result. By pushing the vertical handle forward, the chair too was propelled forward thus saving energy and effort which comes from the need to manually turn the wheels by hand. The lever itself was constructed using innovative 3D printing software and technology. The second of the inventions piqued our interest as Mohammed told his colleagues he’d always wanted a handy place for his cup and his computer but hadn’t been able to find a suitable attachment to his wheelchair online. Fellow students designed a wooden wheelchair computer tray which slides into place over the arm rests of the chair. 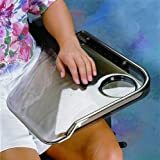 The tray has been described as much like an aeroplane tray but it’s hinged with an opening within where space has been created to store an iPad, a book and conveniently, hand sanitiser. The pieces are designed to snap together and apart with ease. The work of the students at NuVu is commendable, seeing any institute focus closely on universal design principles and ideas which can suit people with a range of needs is a real positive. However, the creations of the students are of course not available for general sale and can’t be enjoyed by other wheelchair users – they were designed as a class project. Instead, a viable alternative, at least for the lap tray, is our Trabasack Mini. Providing the same functionality as the NuVu students’ tray, you benefit from a tray and a secure bag in a single unit, which you can keep on your lap or hang from your chair when not in use. The universal design means it isn’t solely designed for wheelchair use so anybody can enjoy one. We’d like to congratulate the innovative thinking and design ability of the students at NuVu and with talent like this, there is hope for even more user-centred design products in the future. Finding the correct iPad Mount for wheelchairs can be difficult. The benefits of iPad use are many and well documented and so more and more wheelchair users are using iPads on a daily basis. Without the right mount, using the device can be difficult. At Trabasack we have two iPad mounting options. 3. You’re ready to and it’s securely attached to your tray surface. The hook tape keeps your iPad completely secure so if you’re out and about and happen to go over any bumps or up and down any hills, you can be sure your iPad will stay safe. Alternatively, if you don’t like the idea of attaching tape to the back of your iPad, you can use the new Trabasack Media Mount. The Media Mount is a multipurpose mounting device designed with iPads in mind. It can safely wrap around your iPad and attach to the Connect surface. It holds the iPad at whatever angle is best for you. You could also lay your iPad flat and use the Media Mount to provide a barrier around the edge to stop it from falling off. There is no reason you can’t use your iPad when out and about but without the correct mount, it can be a worry. It’s an expensive piece of kit that you want to protect and making sure it is safe is obviously always on your mind. With a Trabasack and in some cases a Media Mount you can be sure your iPad is safe and accessible. Also, when you’re not using it, you can put it in the bag space for safe keeping. Finding the right iPad Mount for Wheelchairs doesn’t need to be difficult, try Trabasack. Click to buy your Trabasack and Media Mount on our secure shop. When you’re a manual wheelchair user there are many considerations you have to take when considering accessories for your chair. One of the best manual wheelchair accessories on the market is definitely the Trabasack Lap Tray and Bag because of its multifunctional usage and its many features which make it a great product for manual wheelchair users. Weight – you need an item which is lightweight and manageable so you can comfortably move around without difficulty or with anything obscuring your line of sight. Look – the design and style of your bag and/or tray is a key factor when you choose it. Like any other item, you want your lap tray and/or bag to look good and fit in with your personal style. Trabasack won a Style Award at Naidex 2011. Functionality – you want your lap tray and/or bag to do everything you expect without causing you any stress or difficulty. Why Trabasack is amongst the best manual wheelchair accessories around. With Trabasack all these needs are met and more. Whereas you may have been considering a separate lap tray and bag, with Trabasack you need just the one great value item. Trabasack is extremely lightweight and designed for comfort and style. The Trabasack Curve is designed to fit the contours of your body and is fitted with a levelling beanbag which sits comfortably on your knee. When not in use, you can simply hang it on the back of your chair with no trouble at all. Another great feature of the Trabasack Curve Connect is the different colour choices available, so you can pick a bag with a trim to suit your particular style for example orange or blue. Trabasack is a fantastically innovative creation which provides all you could need from a lap tray and bag without looking like a clunky clinical invention. There is no need for complicated connecting clamps or wooden surfaces; your Trabasack has its own fantastic tray surface which can hold a range of items from food to gadgets. It is everything you could need. If you’re a manual wheelchair user, you need a Trabasack. It is one of the best manual wheelchair accessories on the market due to its fantastic dual usage and its fashionable not functional appearance. 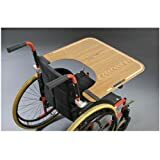 Wheelchair Lap Trays – the competition! As inventors of a wheelchair lap tray, we only thought it fair to compare our product to others on the market. Now, when Trabasack was first designed our main aim was to create something unlike the clinical, clunky look of wheelchair trays. We wanted to invent something easier to use and with a wheelchair user in mind. The result was our ergonomic, light-weight, stylish and versatile Trabasack lap tray and bag. 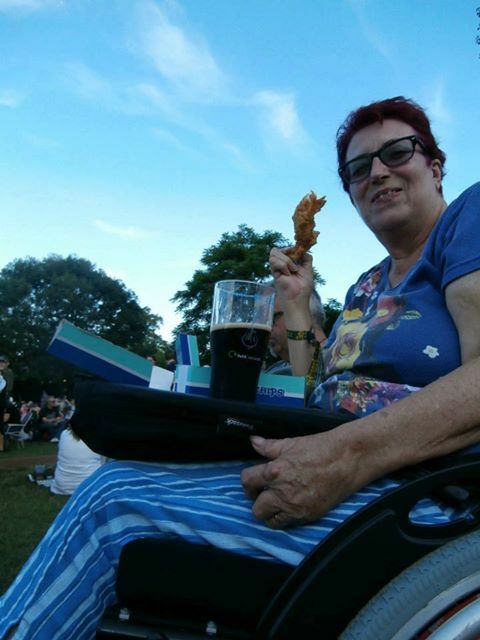 We thought it’d be worthwhile having a tongue-in-cheek look at some of our competitors and why exactly Trabasack is your best wheelchair lap tray choice! 1. The Wooden Laptray – available for around £99.00 and well as the photo shows, not the most comfortable looking product. Secured to your wheelchair with hook and loop straps, this product is reminiscent of a school desk and although functional, has a bit of a retro sideboard feel! 2. Moulded Laptray – available for around £49.99 and is made from moulded plastic and features and moulded cup holder. Designed to look like a child’s high chair tray and from the photo looks extremely clinical and not ideal in a social situation. It could feel like a social barrier or be a little too reminiscent of hospitals. Not really the image one wants to portray! 3. Flip Away Half Tray – available for around £99.99 and also made from moulded plastic featuring a cup holder and can be easily flipped away. This design is clearly a step up from the others, it does have a bit of an “I’m just about to have an in flight meal” look. Although it doesn’t trap you behind a piece of plastic quite as much s the one above and it can be moved away when transferring from your chair. Difficulties come in attaching it to an armrest, all chairs and people are so different, you will be lucky if this suits you. The hard edges of the tray surface and the corner may also catch door frames and maybe even other peoples groins! So how does Trabasack compare? the older tray designs, you can clearly see how much more functional the Trabasack design is. You never have to worry about transfer issues or having to screw the tray to your chair, your Trabasack lap tray is extremely easy to move and much more comfortable due to its beanbag cushion for comfort. The Trabasack is also a handy bag so instead of becoming another thing that you have to carry around, you can actually carry things inside it. I hope you also agree that our Trabasack products at between £35 and £45 are much better value for money! 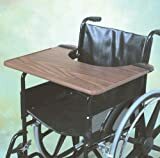 There really is no other wheelchair tray in comparison!